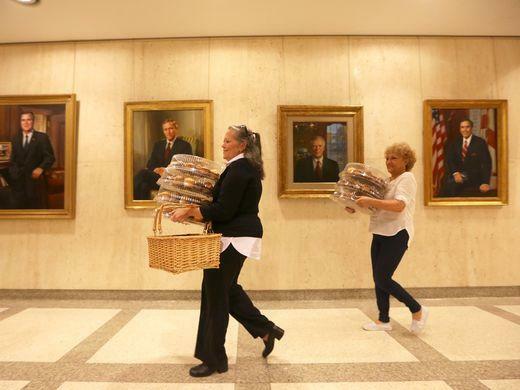 Michele Carmichael and her aunt Barbra Joan deliver 300 muffins in many forms to Governor Rick Scott Thursday. Using the similarity between McMuffin and the name McMullin as humor, two of the more than 250,000 members of the Independent Party of Florida brought the breakfast to the governor's office, hoping Scott would direct Secretary of State Ken Detzner to reconsider the decision not to include their party and its nominee on the ballot. Scott was out of town, at an event in Tampa. McMullin supporter Michele Carmichael delivered the muffins. She says voters should have more options than just major party candidates. “We are hoping to have Gov. Scott just maybe rethink his position and see that there are a lot of people in Florida who feel that they would like to have this option," said Carmichael. A spokeswoman for the Department of State says the agency followed state law in setting up the ballot, which contains candidates from six parties: Republican, Democrat, Constitution, Reform, Libertarian and Green. Florida statutes require a party to be recognized nationally by the Federal Elections Commission for inclusion. McMullin has appealed the decision, but many county supervisors of elections are already printing their ballots. The first ballots go out to overseas and military voters on Saturday.Vote-by-mail ballots will start going out within Florida on Oct. 4. As for the $500 worth of muffins, after being turned away by the governor’s office, they were donated to a Tallahassee food bank.